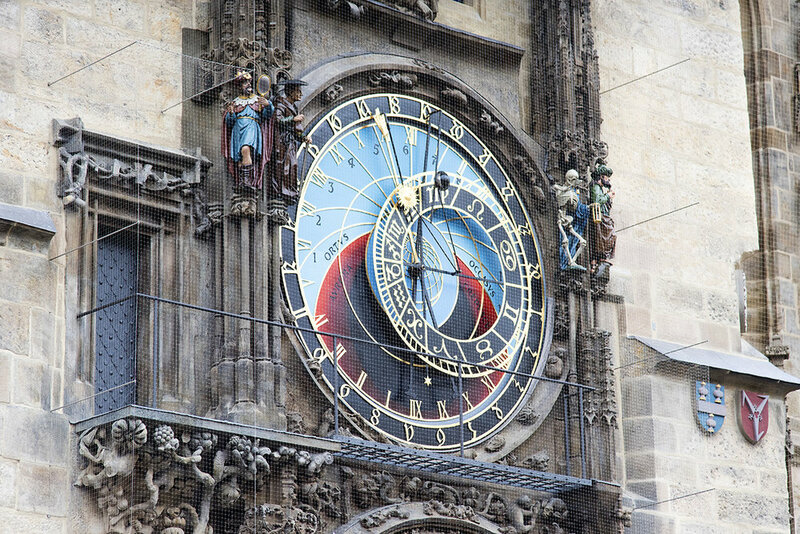 This is the famous atomic clock in the Prague Old Town Square. Every hour on the hour crowds gather to watch “The Walk of the Apostles.” If you look above the clock a few photos down you’ll see two blue doors, which open on the hour so that various apostolic figures can show their faces. Cool, but kind of anti-climactic for me. What is SUPER cool, however, is that the oldest part of this clock dates back to 1410. This ancient timepiece has all kinds of awesome features, including an Old Czech time scale and a zodiacal ring. This clock (and the awesome archway beside it) is on the same building as the atomic clock. Just in case you need another clock. The Municipal House, another concert venue in Prague. This is Náměstí Republiky, a Prague metro station. 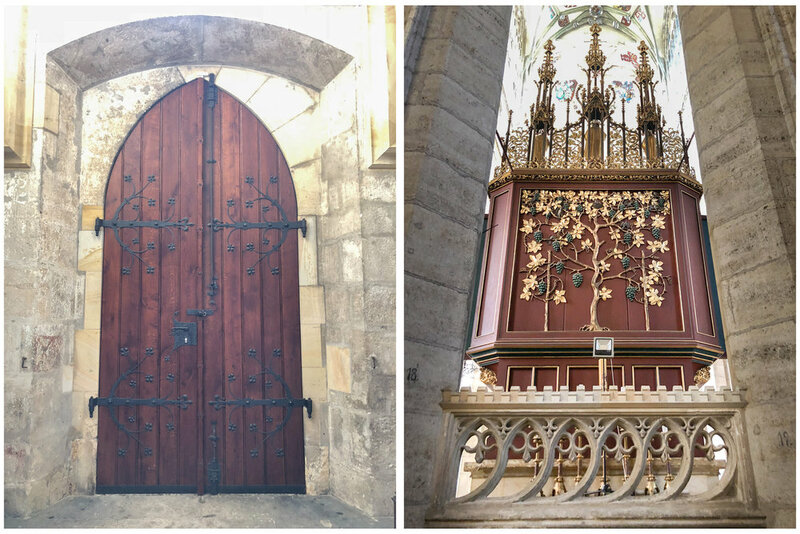 I’ve been debating on whether to do an entire post on the windows and doors of Europe, or to place them in their proper context when I’m blogging about a certain location. I decided on the latter. To put it mildly, I became obsessed with all the ornamental doors and windows I encountered. There is so much beauty to take in! So much exquisite detail. I found the architecture in Europe a feast for my soul. Beauty matters. 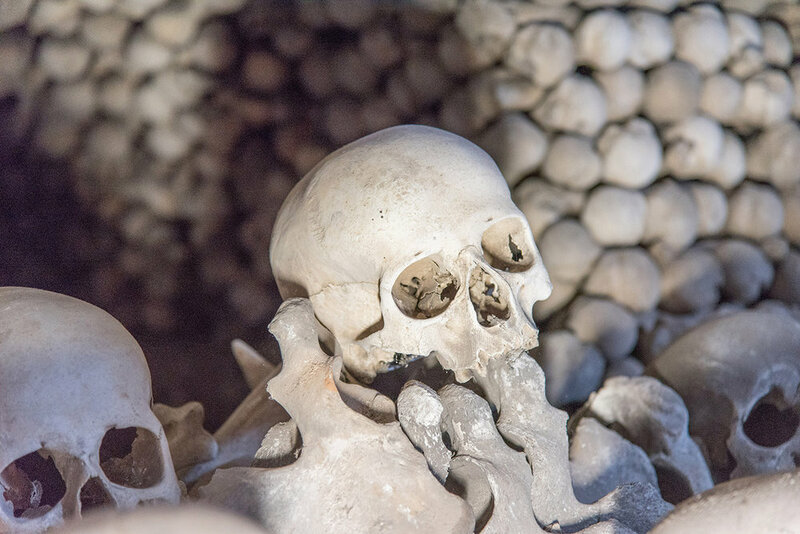 After touring Prague for two days we decided to look for a day trip and agreed that we’d take a tour to Kutná Hora to visit the Sedlec Ossuary. I had never been to an ossuary and was surprised to learn that the remains of between 40,000 and 70,000 people had been artistically arranged to mark their final resting place. Contrary to what you might think, it wasn’t creepy—at least to me; it commanded deep sense of reverence. 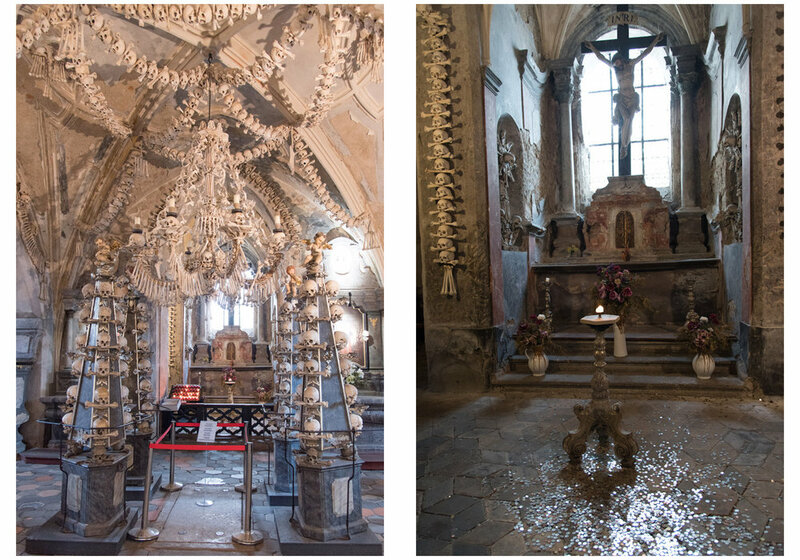 Unfortunately, the Sedlec Ossuary was also the final resting place of the shutter in my Nikon D750. I was soooooo bummed out to be in Europe without a camera, especially at this small Roman Catholic chapel. If you look back on the last post you can see an arc in a few photos that signals that my camera was ailing. It chose this location to completely crap out on me, as evidenced by the black lines in the next two photos. From here on out, everything you see in this particular post is an iPhone photo. Better that than nothing, right? 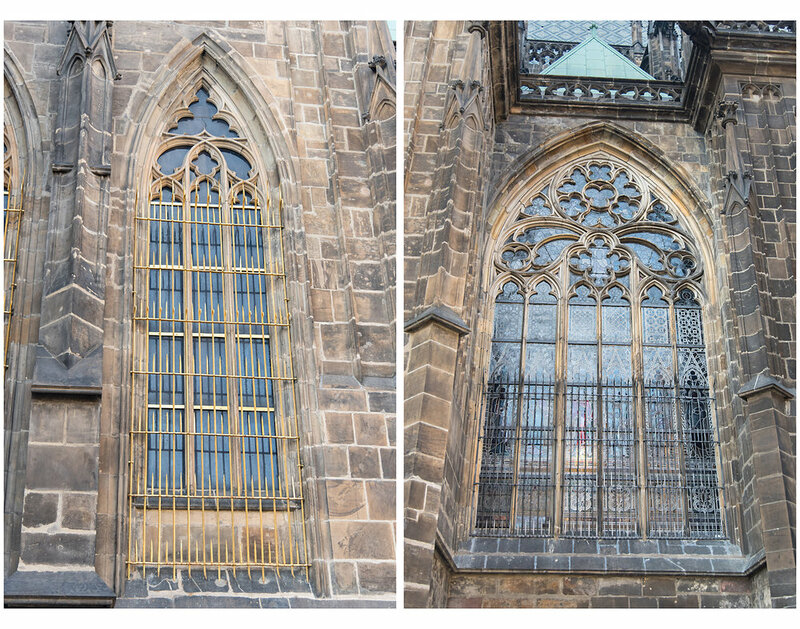 After the Sedlec Ossuary we went to St. Barbara’s Church, which was—like every other religious structure we saw—gorgeous. After wandering around the church we had a delicious meal at a restaurant I can’t remember the name of. Then we boarded the train back to Prague. When we arrived at the station in Prague we walked past this bronze memorial honoring Holocaust hero Nicholas Winton, who saved 669 Jewish children that were destined for concentration camps. A former stockbroker, Winton took out ads in British newspapers to find foster homes for the children. He died in 2015 at the age of 106. This was our last night in Prague. 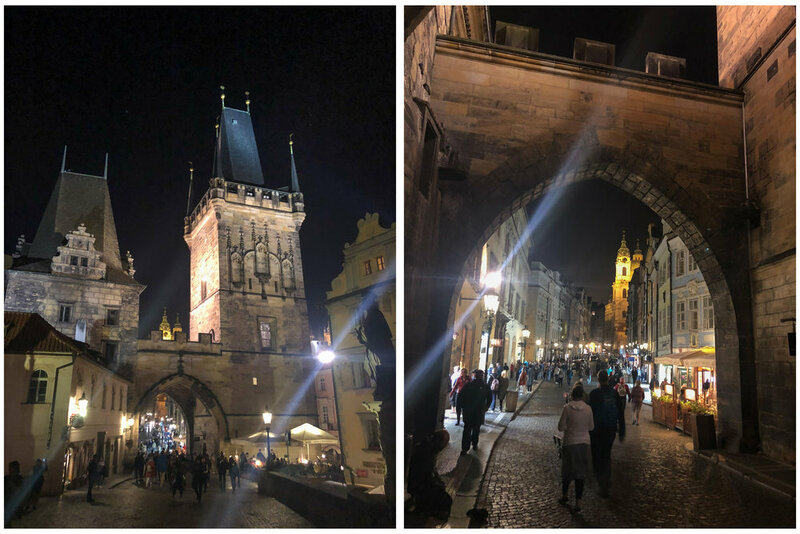 I planned all along to photograph the square at sunset and climb the tower above the Charles Bridge to take nighttime photos, but my shutter was kaput. So all I had was my phone. These will have to do. Next up: Vienna, in all of its circusy glory.